The purpose of this book is to produce what is essentially a ‘home front’ study of Ireland during the Crimean War, or more specifically Irish society’s responses to that conflict. 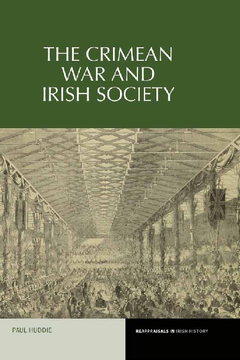 This will principally complement the existing research on Irish servicemen’s experiences during and after the campaign, but will also substantially develop the limited work already undertaken on Irish society and the conflict. This book primarily encompasses the years of the conflict, from its origins in the 1853 dispute between Russia and the Ottoman Empire over the Holy Places, through the French and British political and later military interventions in 1854-5, to the victory, peace and homecoming celebrations in 1856. Additionally, it will extend into the preceding and succeeding decades in order to contextualise the events and actors of the wartime years and to present and analyse the commemoration and memorialisation processes. The approach of the study is systematic, with the content being correlated under six convenient and coherent themes, which will be analysed through a chronological process. The book covers all of the major aspects of society and life in Ireland during the period, so as to give the most complete analysis of the various impacts of and people’s responses to the war. This study is also conducted, within the broader contexts not only of the responses of the United Kingdom and broader British Empire but also Ireland’s relationship with those political entities, and within Ireland’s post-famine or mid-Victorian and even wider nineteenth-century history. Dr Paul Huddie read history at University College Dublin and Queen’s University Belfast between 2005 and 2013. He was the recipient of a four-year research studentship 2009-13 and successfully defended his doctoral dissertation in 2014. His research has been published in a variety of journals in Ireland, the United Kingdom and the United States, he has been awarded the 2013 Crimean War Research Society’s President’s Trophy and the 2014 Anna Parnell Travel Prize, and presently sits on the committees of the Irish Association for Professional Historians and the Women’s History Association of Ireland. His research principally focusses on British and Irish societies’ relationships with war, during both peace and wartime, in the long nineteenth century.